The win elevates Devonport, temporarily at least, into second position on the ladder, but the Strikers are now also equal on 18 points with Hobart Zebras in first place. Rangers fought hard and were competitive for 90 minutes, but in the end succumbed to a dominant Devonport display. 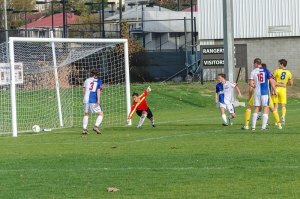 The loss condemns Rangers to the bottom of the ladder after Kingborough Lions scored their first victory over Clarence, 4-1 to leap frog Rangers and Clarence into sixth place. Dane Hudson stated mid-week that Northern Rangers would head into this clash with an unchanged 11 from the side that drew with Launceston City 2-2 in Round 6. However, the Rangers coach spoke too soon, as his centre forward Mark Cristy suffered a knee injury that places him on the long-term injury list. Geoffrey Wani, who is a young player and a raw talent with pace to burn, would replace him on the team sheet. But the rest of the side were well rested after a week off, as Rangers had already been eliminated from the Milan Lakoseljac Statewide Cup. Conversely, the Strikers came into the match with a full squad, and spring in their step after advancing to the final of the Lakoseljac cup by demolishing Somerset Sharks 10-0 away from home. From the kick-off Devonport were quick to stamp their ascendancy and put a stranglehold on the contest. The game was played on Devonport’s terms as they established a pattern of dominance, both in terms of possession and territory that would persist until the final whistle. Devonport were composed in possession and played out from back. They consistently found the feet of Adam Gorrie, Beau Blizzard, Joel Stone & Brayden Mann deep in a central attacking position. The next step for Devonport would be to spread the ball into wide positions and then look for the cross into the box. Daniel Syson played a crucial role in his distribution of the ball from the defensive midfield position. Devonport would create their first clear chance of the game in the 15th minute. A Rangers turnover resulted in Brayden Mann finding some space and time to shoot from just beyond the left hand side of the 18-yard box. Mann’s curling effort was headed for the top left hand corner of the goal until a ‘SpecSave of the Week’ contender from Rangers goalkeeper, Luigi Cordova, kept the score line at 0-0. By the 36th minute the Strikers’ bossing of the game had resulted in eight corners. However, Spanish recruit, Jorge Palacio and English recruit, Conor Doherty would consistently thwart the Strikers in their forward thrusts and the Rangers defence proved resolute and well-organised. Despite a number of crosses into the box from open play and corners, Devonport had not managed to capitalise. 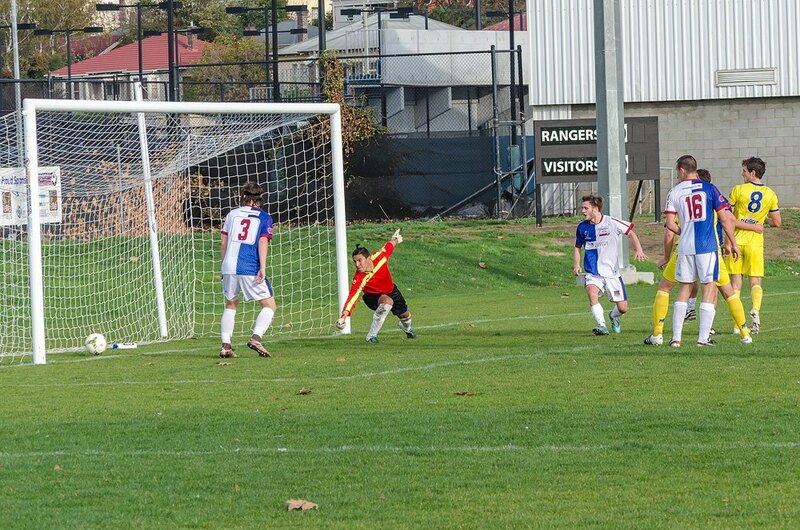 But in the 40th minute, Devonport finally managed to break the deadline and the Rangers defence. After another attack from wide on the right by the Strikers, they earned themselves a free kick on the corner of the goal line and 18-yard box. Adam Gorrie curled the resultant free kick inwards toward Cordova who parried with both hands high into the air. The ball would fall on the penalty spot where Joel Stone met its arrival with a low hard volley that took a small deflection and ricocheted into the back of the well-protected Rangers net to give Devonport a well-deserved lead. Both sides headed into the sheds at half time with mixed feelings on the contest. Rangers had defended well, but would be disappointed to give away a scrappy goal. Devonport would be pleased to be ahead, but would like to have created a few more clear-cut chances, and been more clinical and direct in the final third. As the second half resumed, so did the pattern of play from the first half, with Devonport quick to establish control. The only difference was a change to the back four of Northern Rangers who replaced Tenzing Anderson with Joshua Lord in the left back position. The Rangers defence would continue to frustrate the Devonport attack with Jorge Palacio instrumental in keeping the Strikers at bay. His reading of the game and timing of his challenges kept the Rangers in the contest. As Rangers continued to hold down the fort, they began to grow confident and more deliberate in their counter attacks. Rangers would begin to counter attack with more purpose and frequency as the game drew to a close; however, their forays into attack were well handled by a composed, experienced and impressive Devonport defensive unit. In the 77th minute, Adam Gorrie found himself with some space and time to cross the ball from the left wing. The cross was weighted perfectly for the oncoming Brayden Mann at the back of the six-yard box. The in-form striker rose above his defender to fire his header into the ground toward goal. However, the bounce of the ball sent it into the corner of the goal post and away to safety for Rangers. But Devonport would not be denied and put the result beyond doubt in the 89th minute. After a Rangers turnover in the midfield, the ball was slipped to Joel Stone in behind the Rangers defence, and he found himself one on one with Cordova. Stone composed himself and finished neatly into the bottom left hand corner to make it a brace for the midfielder. The sound of the final whistle was a relief for 22 players who were very tired at the completion of a physical tussle. The game was played in a hard but fair fashion, and the referee returned to his locker room not having distributed any slices of cheese. Doherty, Nick Lanau-Atkinson & Bruce Bown all impressed for the home side, but the best afield for Rangers was Jorge Palacio, whose defensive exploits undoubtedly kept his side in the contest. For Devonport, it was very much a team effort with excellent performances across the board, which will please coach, Peter Saville. Brayden Mann looked good in a rare scoreless 90 minute effort, Gratton, Zuppo & Mulraney were composed and commanding in defence, and Joel Stone was the best on ground for his two goals and dogged midfield display. It is back to the drawing board for Rangers whose season gets no easier next week with an imposing away trip to league leaders, Hobart Zebras. Devonport host league newcomers, Clarence at Valley Road in a clash they would be expecting three points from, as the chase for the PS4 NPL Tasmania championship continues in Round 8.